Writer's note: Happy 63rd Anniversary to Disneyland and 18th to MousePlanet. I cannot believe it has already been a year since I attended the D23 Expo in Anaheim, was at the Park that started it all to celebrate its 62nd Anniversary, and saw the debut of the current version of Fantasmic! running there (after interviewing Mickey Mouse on the Dream Suite balcony). Thinking about Disneyland's version of Fantasmic! just reminds me of how dated the version playing at Disney's Hollywood Studios appears while the park has its attention on this year's recent opening of Toy Story Land and next year's opening of Star Wars: Galaxy's Edge and Mickey & Minnie's Runaway Railway inside the Chinese Theatre. While there was little news around Walt Disney World Resort this week, with the Incredible Summer fully underway, Disney used the week to make us more familiar with the ESPN Wide World of Sports Complex, now in its 21st year and still growing, and the "Disney After Hours" hard ticket events, which have run on select nights for roughly three years and still have six more nights scheduled on the calendar this summer at Magic Kingdom. As a vacationer from Chicago, I had never made my way over inside the Sports Complex, and have only visited it a handful of times since moving to Central Florida in 2014. With regard to "Disney After Hours," it is a very fun and unique way to experience Magic Kingdom, but, as I suspected, its high price point ($119 plus tax for advance purchasers before available discounts), is probably aimed at a limited category of guests and not those, like me, that are local Disney Vacation Club Members and Annual Passholders that visit Magic Kingdom weekly or more. 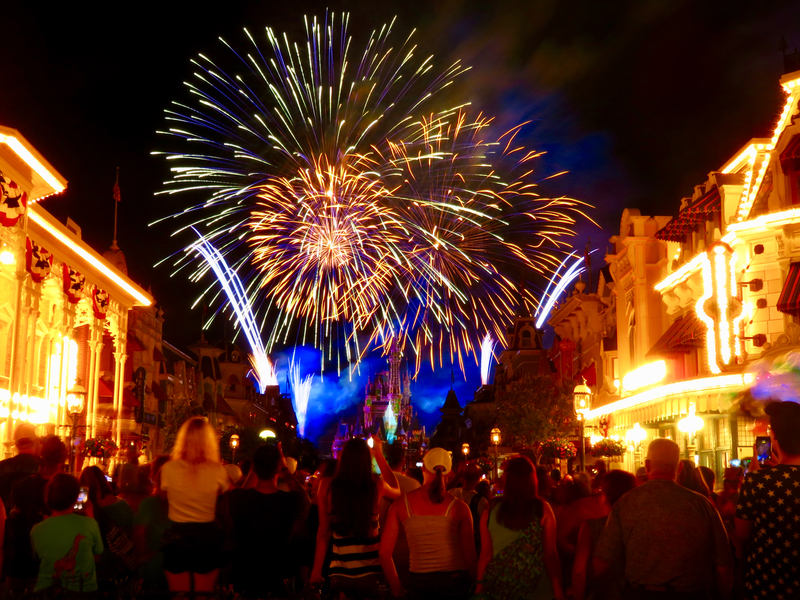 For many Disney After Hours event guests, the evening begins with a viewing of the Happily Ever Fireworks show, since event guests can "mix-in" with the day guests a few hours before the park's close and the event's start. Long Exposure Photo by Alan S. Dalinka. As we mentioned on Social Media, this week's Update was moved from its usual Tuesday publication to Wednesday because of the media events. On Friday, we will start sharing on Social Media the additional details we learn during a Christmas in July media event that may help you make your plans to visit Walt Disney World Resorts during the holiday season. Next week, the Update should return to its usual schedule, and we will include a summary of the holiday offerings plus, of course, the latest news. ESPN Wide World of Sports Complex opened in 1997, and is little mentioned in our weekly reporting here at MousePlanet. For this writer, despite my numerous visits to Walt Disney World Resort, I have to admit that I had not ever even visited the 220 acre Complex, originally named Disney's Wide World of Sports Complex and rebranded ESPN in 2010, until Orlando hosted the NFL Pro Bowl in January 2017, when the Complex welcomed the public for free to many of the ancillary activities held on the site. For guests who are not athletes or coaches participating in an event at the Complex, there is an admission fee required to enter the grounds (currently: $18.50 for ages 10 and up; $13.50 for children ages 3-9). Some Walt Disney World Resort ticket categories, however, do include admission, such as the Platinum Plus Annual Pass (which I current have) and some of the "add-on" packages offered when buying other multi-day theme park tickets. Premium and Special Events may also require additional admission, like Atlanta Braves Spring Training games, which have been held at the Complex since it opened and will return most of the Spring of 2019 before the team relocates to South Florida to be closer to many of the other teams' spring training locations. 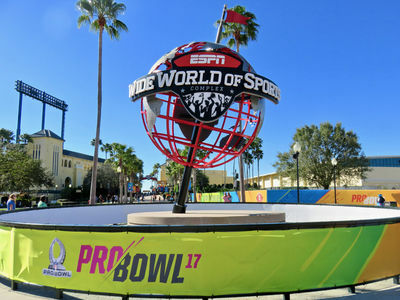 ESPN Wide World of Sports Complex hosted the NFL Pro Bowl Experience in January 2017 and again in January 2018. File Photo by Alan S. Dalinka. 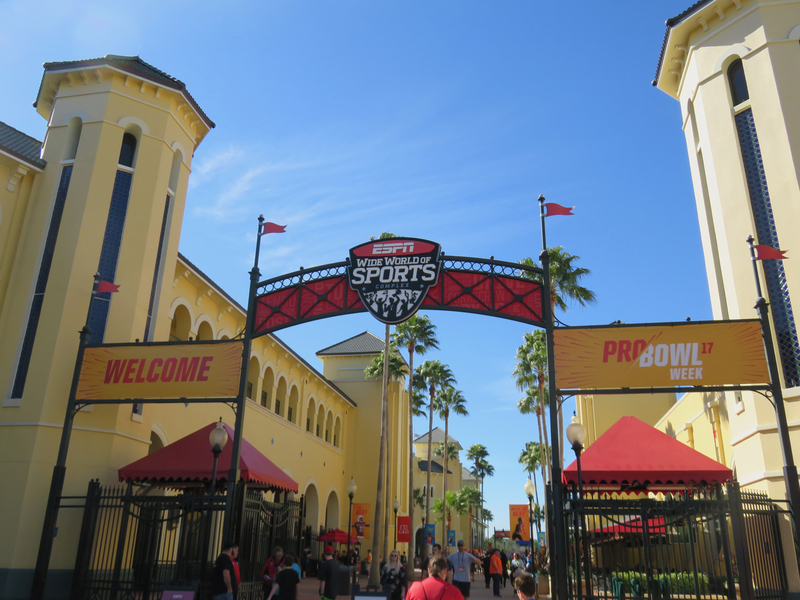 ESPN Wide World of Sports Complex was open to the public for free during the NFL Pro Bowl Experience in January 2017 and again in January 2018. File Photo by Alan S. Dalinka. Given its size and the thousands of professional and amateur athletes, coaches, competition officials and judges, and spectators (including the families of the athletes) that pass through its gates each year, it is an important part of Walt Disney World Resort and, in that respect, the Disney Sports team invited me along with other local media and national sports media to extensively tour and learn more about the Complex earlier this week. 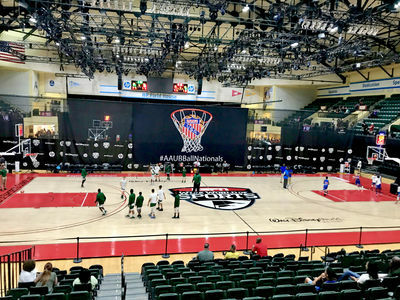 In particular, Darrell Fry, Sports Media Director, Walt Disney World Resort says that the "Complex is taking youth sports to a new level by providing America’s youth athletes with a big-time sports experience that can’t be found anywhere else." 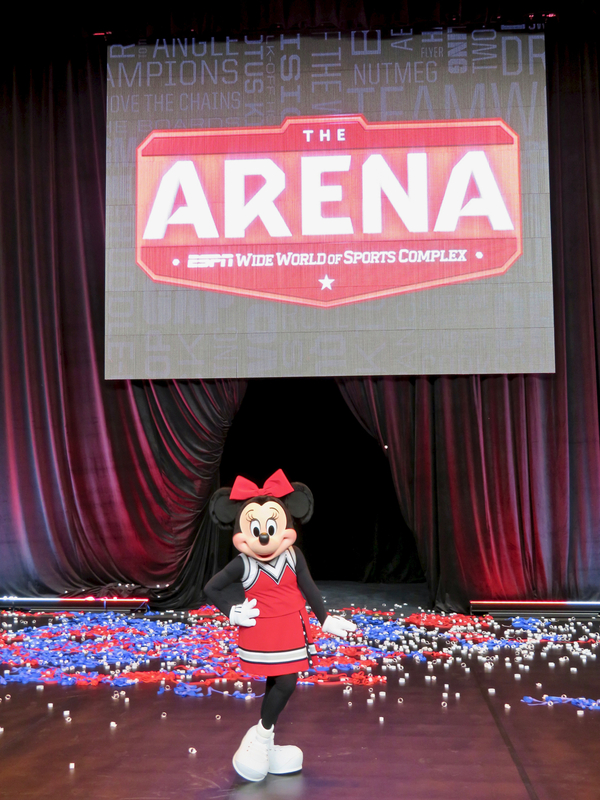 He adds that ESPN Wide World of Sports Complex provides "world-class facilities, unrivaled Disney entertainment and the top-notch sports events that separate the sports complex from any other venue." ESPN Wide World of Sports Complex is located on Victory Way in the opposite direction across Osceola Parkway from Disney's Hollywood Studios. 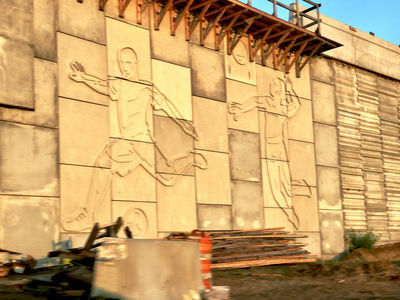 The new flyovers under construction at the intersection of the two roads will assist in handling the new traffic flow into the theme park, and the ones closest to the Complex are decorated with sports figures. Photo by Alan S. Dalinka. 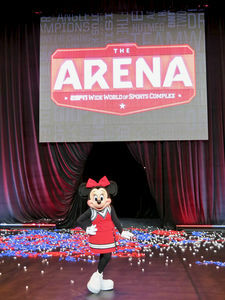 For the opening of The Arena at ESPN Wide World of Sports Complex, Minnie Mouse got a new cheerleading outfit. The Arena is a multi-purpose facility designed with hosting cheerleading competitions in mind. File Photo by Alan S. Dalinka. 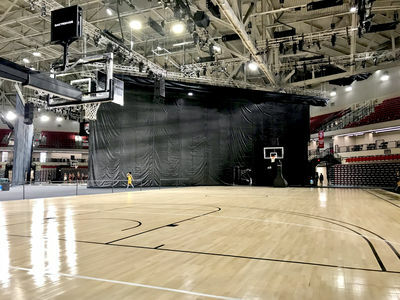 Though purpose-built for cheerleading, The Arena can also be configured for other sports including multiple basketball courts (as it is this week for the Amateur Athletic Union, volleyball, gymnastics, and other functions like the runDisney Health & Fitness Expos. Photo by Alan S. Dalinka. The venues that make up the Complex include: Champion Stadium, The Arena (which opened in January and we covered in the Walt Disney World Resort Update for January 17-22, 2018), HP Field House, Visa Athletic Center, Baseball Quadraplex, Softball Complex, Tennis Complex, Track & Field Complex, ESPN Television Production Center (and TV Studio), Welcome Center (which serves like Guest Relations do in the parks, providing guest assistance with theme park tickets, dining reservations, in addition to events at the Complex), the ESPN Wide World of Sports Grill (and, when events are going on, concession stands, all of which include menu items that can be purchased on Disney Dining plans and, increasingly have numerous healthy choices), and retail shops (including pop-ups). 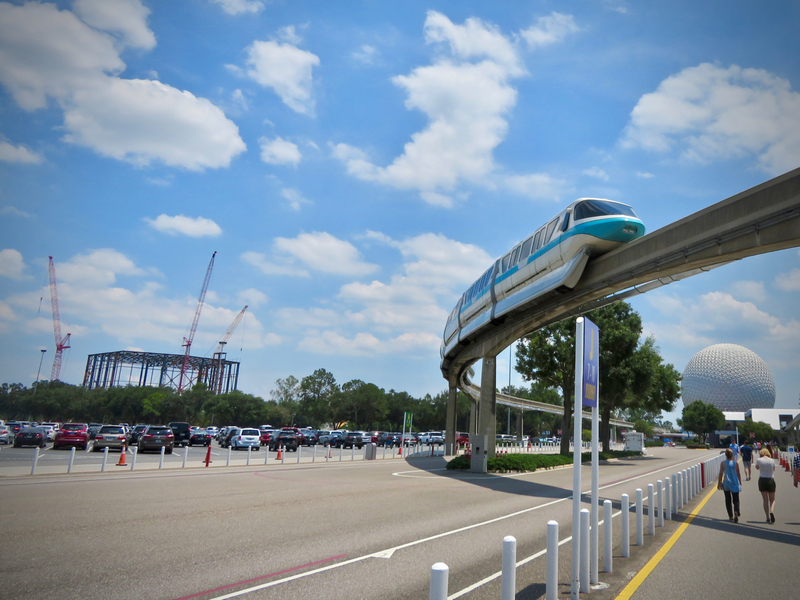 Parking at the Complex is usually free (bucking the trend around the Resort) and, of course, Minnie Vans can take you there (and, for many events, Disney Resort buses too). 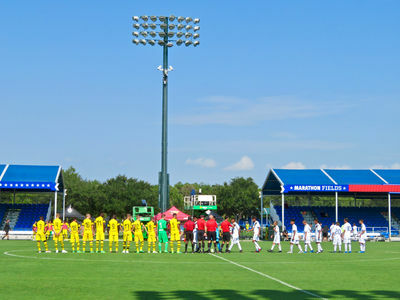 Champion Stadium, the Spring Training home for Major League Baseball's Atlanta Braves from the opening of the Complex (through most of 2019), is a flexible facility where the outfield was converted this week into two soccer pitches as the Complex hosts the Disney International Cup and the International Champions Cup at the same time. Panoramic Photo by Alan S. Dalinka. 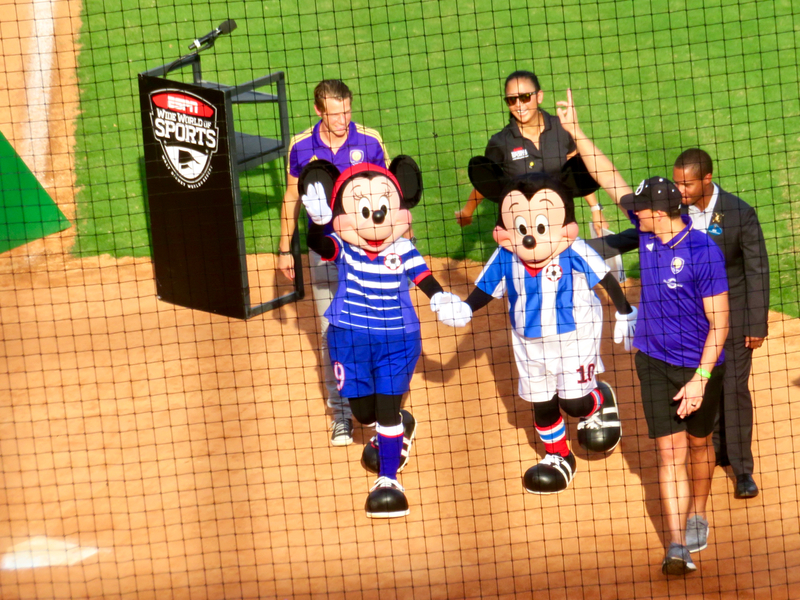 Walt Disney World Ambassador Ken Facey, Mickey Mouse, and Minnie Mouse were joined on the field at Champion Stadium by Orlando City Soccer Club (in their purple jerseys) captain Jonathan Spector and goalie Joe Bendik during the opening ceremony for The Disney Cup International. 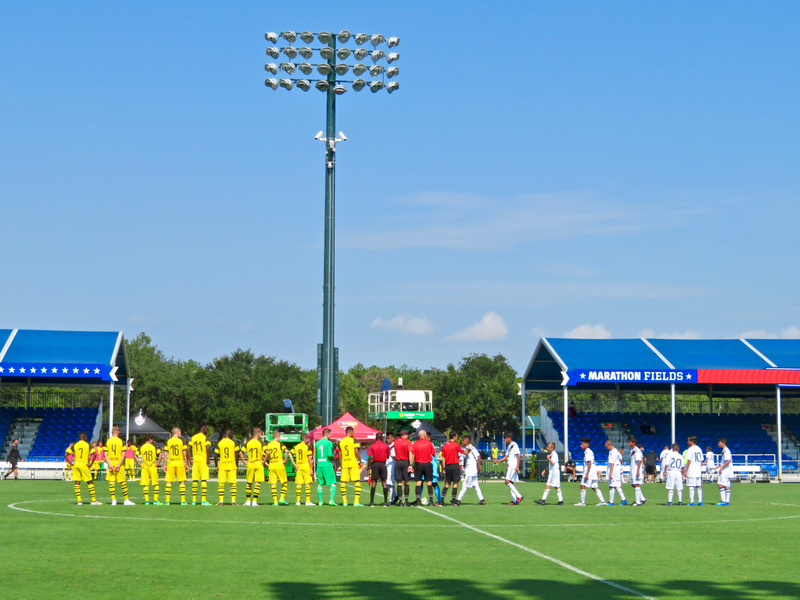 The Disney Cup International, in its 17th year, includes youth soccer teams from more than 20 countries. The players had the opportunity to parade across the field after being announced by country during the ceremony. Photo by Alan S. Dalinka. Marathon Fields are currently hosting the inaugural International Champions Cup Futures U-14 Soccer Tournament featuring 24 teams from the U.S. and Europe comprised of the top youth U-14 players in the world, including eight teams from Major League SOccer's Development Academy, eight USA all-star teams and eight European academy teams associated with leading professional soccer (footbal) clubs. In January 2017 and January 2018, the Fields were used by NFL Pro Bowl (U.S.A. football all-star) teams for workouts. Photo by Alan S. Dalinka. 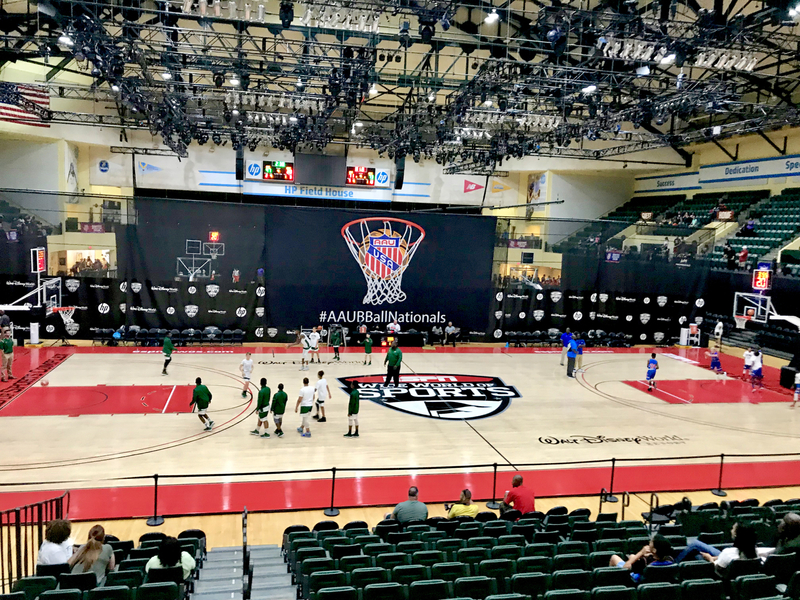 HP Field House is also a multi-purpose venue and is configured this week to host AAU Basketball (you may have seen it on a broadcast). Photo by Alan S. Dalinka. Many of the venues are multi-purpose and can be reconfigured to serve different sports. All told, the Complex hosts more than 100 events each year with more than 60 different sports. The ESPN TV production facilties provide video of many events to not only the numerous ESPN cable, satellite, and streaming platforms, but to other broadcasters around the world. The team in the Production Center described the 8k television camera technology being deployed that, coupled with artificial intelligence, significantly reduces the cost of video production yet creates images of a high enough resolution for the highest definition uses. Indeed, for youth athletes, it allows their competitions at the facilities to be recorded and/or broadcast more than ever before which is useful both as a motivator for the athletes themselves and for the athletes being able to showcase their talents within their sports to those at higher levels in the sport who may be interested in recruiting or developing their talents. 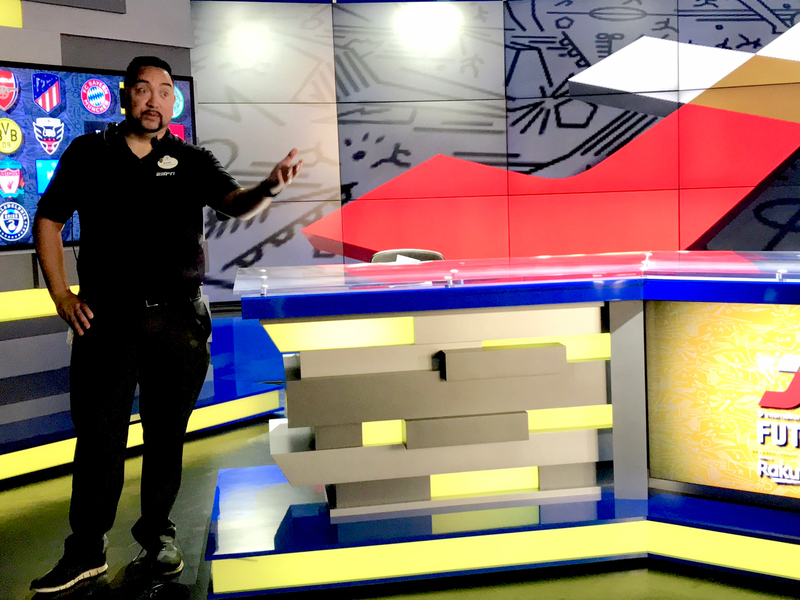 The Production Center is the leading producer of ESPN3 content and also provides content for one of the Resort's in-room TV channels. A fully functional TV broadcast studio is located at ESPN Wide World of Sports Complex that is used for broadcast by numerous ESPN outlets as well as other broadcasters around the world. Photo by Alan S. Dalinka. To answer the question we received at MousePlanet on Twitter (and one that I have had): is there an independent reason to visit the Complex if a guest has no interest in sports, the answer to that is probably not. The "Florida Picturesque" style of architecture is interesting, and the principal architect of the Complex, David Schwartz, also designed The Ballpark at Arlington, home of Major League Baseball's Texas Rangers, but for a theme park fan, there is probably little to see or do unconnected to sports in some way shape or form. Indeed, even the photo services at the Complex are focused on sports (like creating a cover of an ESPN magazine featuring you in your favorite sport). Having said that, with the opening of The Arena earlier this year, the Complex is also open to the public (at no charge) for the Health and Fitness Expo component of the runDisney races at Walt Disney World Resort. For guests wanting to get a look around, possibly get a glimpse of Disney characters dressed in their sports uniforms or even playing a bit of sports, those free events are a great time to visit. (Note, however, that as of this publication, the 2019 location for the NFL Pro Bowl has not been announced.) We welcome further questions about the facility and would love to hear from those of you that visit in connection with events of all kinds. 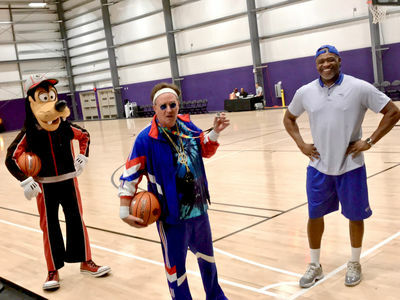 Retired Orlando Magic basketball player, Nick Anderson (on the right), the team's first ever draft pick when the team entered the league joined Goofy and their "coach" for a chat with the media at one of the training facilities connected to The Arena about the role the Complex plays in helping young athletes develop. Active and retired professional athletes often visit and work out at the Complex throughout the year. Photo by Alan S. Dalinka. 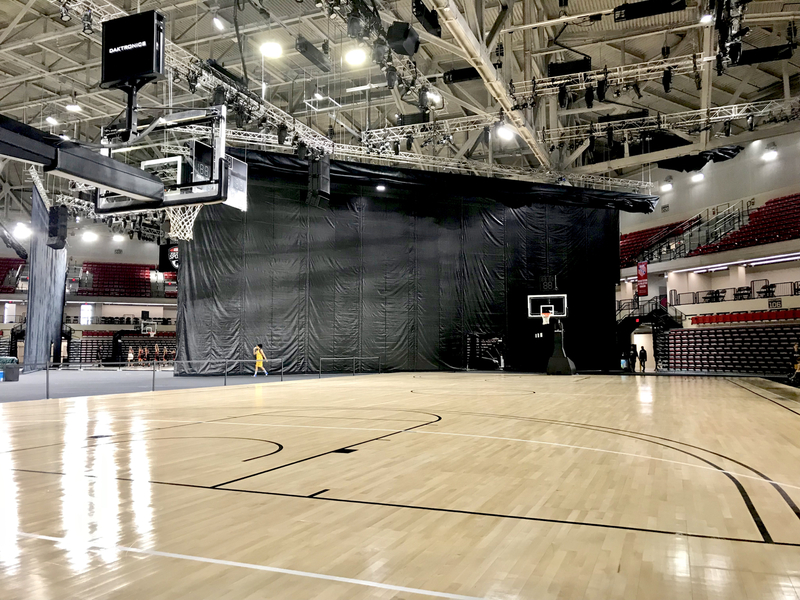 Goofy goes for a layup on a basketball court at The Arena at ESPN Wide World of Sports during the media tour of the facility earlier this week. Video by Alan S. Dalinka. 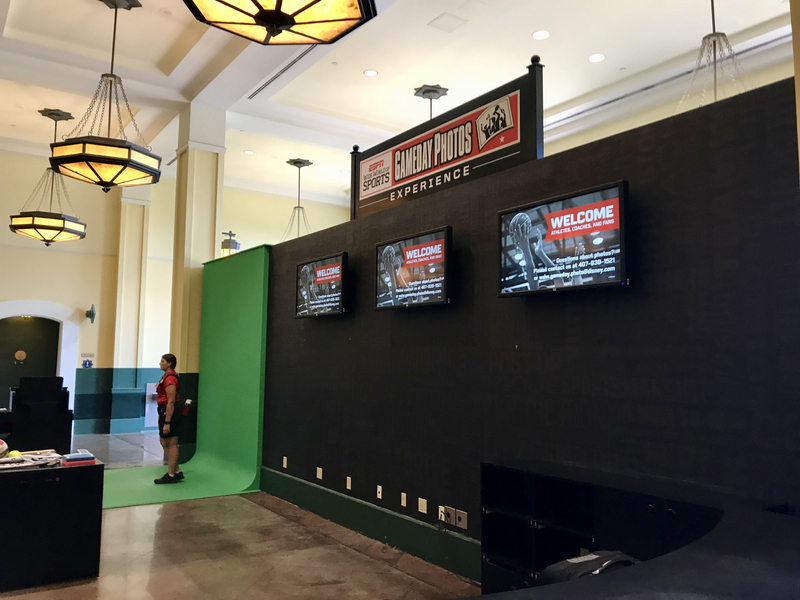 A green screen at the photo services desk allows guests to purchase their likeness on a cover of an ESPN magazine featuring their favorite sport. Photo by Alan S. Dalinka. 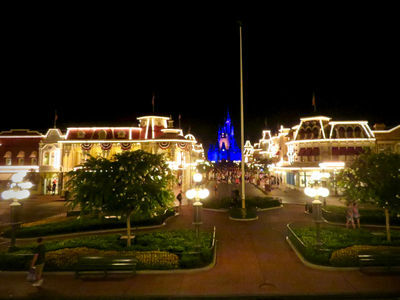 For well-more than a decade, Magic Kingdom has offered guests special after-hours "parties" that require guests to pay separate admission to attend and remain in the park after its official evening closure. 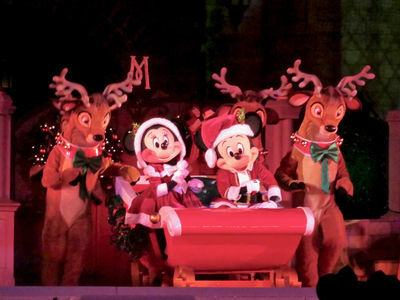 In their present form, the main allure of both Mickey's Not-So-Scary Halloween Party and Mickey's Very Merry Christmas Party is that these "hard ticket" events offer special entertainment available exclusively (or almost exclusively) during the parties plus the opportunity to meet characters that do meet and greets (or, at least, wear special costumes) exclusively during the parties. As I have seen firsthand (when Disney has held media nights at these parties and when I got a ticket by registering for a Disney Parks Blog meet-up), many guests spend their entire party night waiting in lines to meet the characters, enjoying the special entertainment, and getting their included-with-admission trick-or-treat Halloween candy or Christmas cookies. 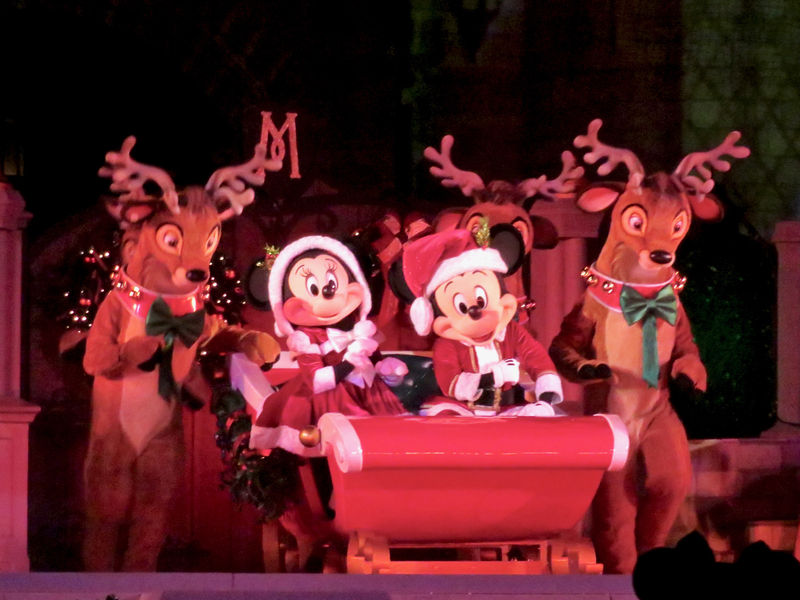 Mickey's Very Merry Christmas Party offers a stage show that is available during every night of the hard ticket event and (for, at least, the past couple of years), to all guests only during the final week of the year. File Photo by Alan S. Dalinka. An additional advertised benefit of the holiday-themed after-hours parties has also been that most of the attractions remain open during the parties and, because attendance is limited by capping the number of tickets sold (coupled with the fact that even passholders have to buy one of those tickets to get in), most are available with minimal wait times. Although the party prices have started to approach the cost of a one day admission to Magic Kingdom (this year's peak date Very Merry ticket purchased at the gate is $105), most dates are available for less to quite a bit less than a one day park ticket. So for those without Park Hopper tickets or Annual Passes, those willing to forego some or all the special entertainment and characters, they can enjoy a lot of what Magic Kingdom has to offer with smaller crowds, low waits, and at a price point below the usual one day price of admission to the park. Disney has had some other after-hours parties at Magic Kingdom over the years that are no longer offered: the most memorable (though I never attended) being the Pirates & Princess Party that was offered on select nights in the non-holiday winter and spring seasons. Those parties were also offered at a lower price than a one day park ticket. Although the policies seem to change a bit from time to time, the special "hard ticket" events also usually come with the ability to "mix-in" with the day guests in the hours before the park "officially closes," thus allowing guests arriving for the late night parties to enjoy attractions, shows, sometimes fireworks, and shops that will not be operating during the party. Cast Members distinguish between the party guests and the day guests by wristbands. 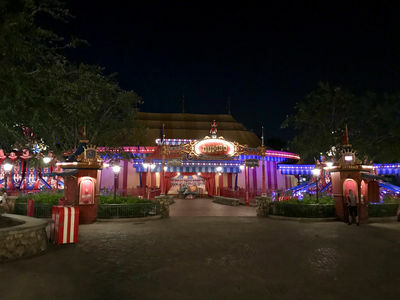 As the official park closing time approaches, Cast Members start asking guests to show their wristbands before entering parts of the park, and, after closing time, guests not wearing wristbands are asked to leave the park and are not permitted on any attractions. 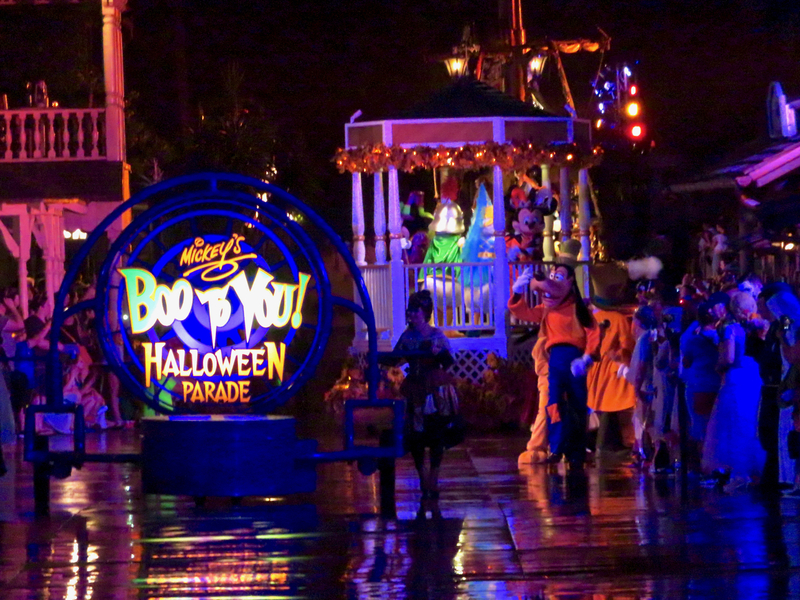 Mickey's Boo to you Halloween Parade is exclusively offered during the Mickey's Not-So-Scary Halloween Party events. Cast Members ask guests without event wristbands to leave the park well-before parade time. File Photo by Alan S. Dalinka. A couple of years ago, Magic Kingdom first offered the "Disney After Hours" event at Magic Kingdom. Its advertised price point was high. To my recollection, it may have even been higher than a one-day ticket to the park for its very first run. The main advertised benefit: a very small number of tickets would be sold, so the limited number of attractions would be available during the entire event with little or no wait. As a Passholder, the new event was of no interest to me; as a local Passholder (even before I was the regular MousePlanet contributor invited to events at the parks), I could find those rare low attendance days and ride a bunch of rides in the same day, and, during busier times, I could often find sufficient FastPass reservations for the "Mountains" to satisfy (even if I have to wait a day or two). None of my local friends expressed any interest in buying tickets to the event. Some out-of-town friends were staying in a Deluxe Disney Resort during one of those first "Disney After Hours" nights and were not interested in buying tickets either. 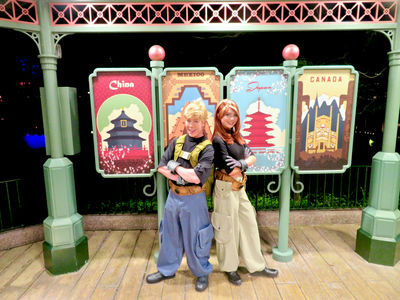 To their "surprise and delight," however, the Disney Cast Members at their hotel provided them with complimentary passes to the event. The rumors at the time were that even with the very low attendance cap that had been set, the park was having difficulty selling tickets. The next day, my friends told me that they absolutely loved their evening of exclusive park access—and, for free, that was not a surprise! After the first run of "Disney After Hours" came and went, many of us expected it would not return. We were wrong. Another batch of them came along in 2017. Increasingly, in 2017, I heard reports of people really enjoying the exclusivity of the events, but I did not have any interest in attending myself. By then, I was the writer of this Update, and always included the relevant information, but I also did not know folks (local or visiting from out of town) who were willing to pay for the privilege on their own. None of our readers ever reached out to me about them either. Late in 2017, a bunch of 2018 dates were announced too (and more were released in May); again, we included them in the Updates and, I assumed, that would be the about the extent of our coverage of them. I was wrong about that too. On behalf of MousePlanet, I was invited to attend Disney After Hours at Magic Kingdom held on Saturday, July 14, 2018, from the park's official closing at 10 p.m. until the end of the event at 1 a.m. Like the most recent holiday parties, the event ticket allowed admission to the park as early as 7 p.m. (which, again, as an Annual Passholder, I could have entered from 7-10 p.m. even without a ticket to After Hours). Like the holiday parties, though, entering the park for After Hours requires entering through the touchpoints marked "Event Entrance" so that Cast Members can provide guests with the event "credential," which is a lanyard (rather than the holiday party wristband). A Cast Member with a sign directs guests arriving for Disney After Hours to the marked Event Entrance touchpoints. HDR Photo by Alan S. Dalinka. 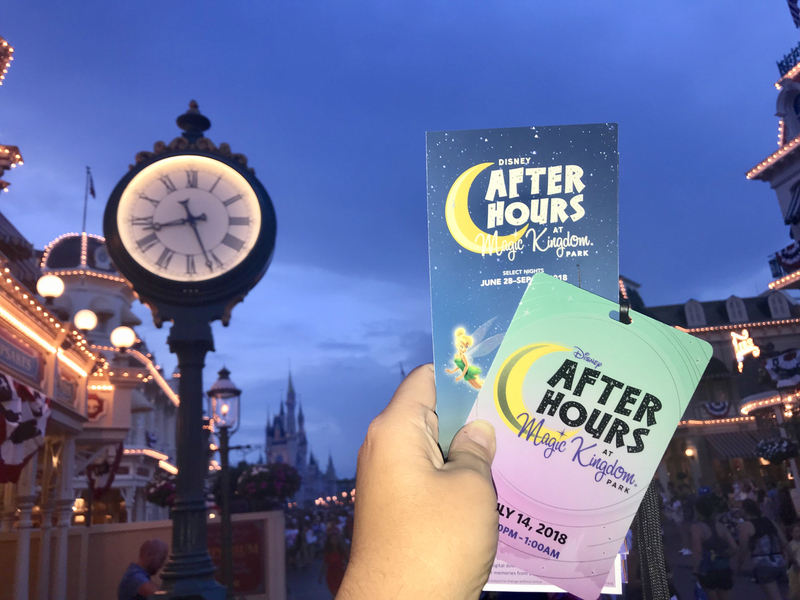 Guests attending Disney After Hours events receive a lanyard credential which includes the event date and time. Event guests may enter the park as early as three hours before park closing which, on July 14, was 7 p.m. for the 10 p.m. park close/event start time. Photo by Alan S. Dalinka. Like the other after-hour parties in Magic Kingdom, the park does provide locations inside the park for event guests who are inside the park on regular admission tickets to check-in and receive their event credential. Photo by Alan S. Dalinka. 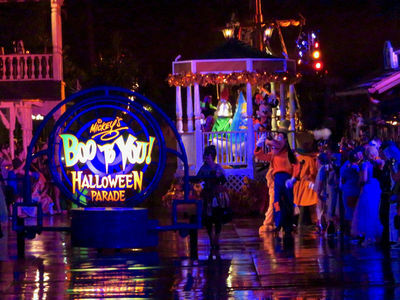 The event advertises that more than 25 attractions are open during Disney After Hours. They may vary from event to event, though the aim seems to be to have the classics and "E-ticket" rides open; the advertising says the attractions to expect include Space Mountain, Big Thunder Mountain Railroad, Seven Dwarfs Mine Train, Princess Fairytale Hall, and Peter Pan's Flight. Once the event starts, the also includes select beverages (Coca-Cola products, water and the like), popcorn and ice cream novelties (including Mickey Bars). As for other food and beverage (for purchase) options, however, only Main Street Bakery (Starbucks) and Casey's Corner on Main Street U.S.A. remained open with limited menus. As for shopping, only the Emporium remained open during the entire event. 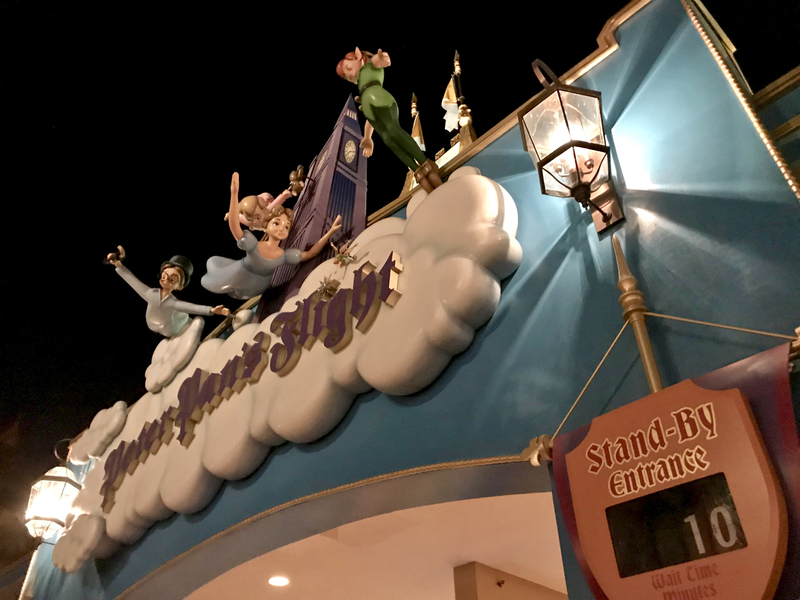 Peter Pan's Flight was open during the July 14 Disney After Hours event and, while the posted standby time was 10 minutes was practically a walk-on ride for much of the event. Photo by Alan S. Dalinka. In the course of the three hour event (with a friend), I enjoyed nine attractions, including a private showing of Enchanted Tiki Room where we were provided an opportunity to "wake up" Jose, a private boat on "small world," and little or no wait time for any attraction, including Peter Pan's Flight (despite its posted 10-minute Standby Time). I concede, it was a unique night in the park, and I had a lot of fun. Though almost no one is in sight in this photo, Dumbo was open during the Disney After Hours event on July 14. Photo by Alan S. Dalinka. I also think I now understand the kinds of guests this event may appeal to even at its high price point and without hitting the obvious cliché response "for the wealthiest guests." Actually, one category used to be me. Back when I was a practicing attorney, on-call 24/7 and traveling a great deal, I often found myself in a place during the day where at night, I welcomed a distraction. Once, that was at Disneyland Resort in California, where a conference I was attending ended up early enough in the day that the special, "Conference ticket" that was then available and allowed admission to Disney's California Adventure (yes, it still had the apostrophe s back then) for only its final three hours of regular operation was a perfect way to cap off a busy work day (and the conference host provided a similar ticket to Disneyland Park the next day to attendees). I could easily say that if I did not already have an Annual Pass because I was a frequent Disney Vacation Club Member-visitor to Walt Disney World, and I found myself in Orlando with an open night in my schedule, a ticket that all-but-guaranteed being able to do everything I wanted to do, even if it meant missing the daytime parade would be worth the price. Similarly, the price for the entertainment even comes out reasonably compared to some other entertainment options that folks may choose. When I last visited Chicago, for example, I paid nearly $200 (face cost but including service fee from the original seller and not a resale) for a balcony seat to see Hamilton. Concert-goers in many venues pay well over that amount (face value) to see their favorite performers. 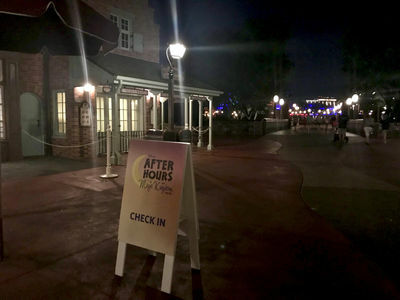 And, finally, the Disney After Hours events are the perfect way for folks who cannot deal with crowds to visit what is sometimes really "The Busiest Place on Earth" instead of its usual "Happy" or "Magical" preferred description. In other Updates, we have written about Disney Vacation Club Moonlight Magic events in the parks. For those not aware, since DVC's 25th anniversary a few years ago, Disney Vacation Club Members have had a number of opportunities to reserve for themselves and a limited number of guests the opportunity to attend special after hours events in Disney Parks on both coasts. 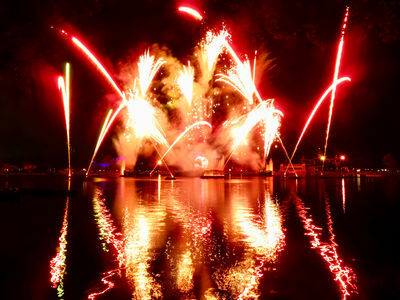 Those events are offered at no charge to the Members and their guests and, like the holiday parties, allow mix-in time, provide opportunities to meet "rare" characters that usually are not in the parks, include complimentary food and beverages, and even some special entertainment (including fireworks or, like at Disney's Animal Kingdom, provide private showings of Rivers of Light). For DVC Members fortunate enough to attend these events (and I am one of them), the Disney After Hours event can seem very expensive in comparison. At DVC Moonlight Magic, characters that rarely appear in the park are one of the attractions of the event that is complimentary to DVC Members and their guests. At DVC Moonlight Magic at Epcot on Monday night, July 16, Ron Stoppable and Kim Possible were meeting and greeting guests at the gazebo near World Showcase Plaza. Photo by Alan S. Dalinka. In sum, for those that have planned their visits to Walt Disney World Resort with FastPass+ reservations, with multi-day tickets (or Annual Passes), Disney After Hours retains only its unique aspect: do you want that Disney PhotoPass photo of you alone (or as a couple or family) on a Pirates of the Caribbean boat? Would you like to have Main Street U.S.A. mostly to yourself? Those are all pretty "cool" opportunities that this event can provide. If you hate crowds and hate lines, these events may be just what you have been hoping to find. For Disney Resort Guests, there are times of the year that Extra Magic Hours may provide a similar experience without additional cost (except for the food and beverages). 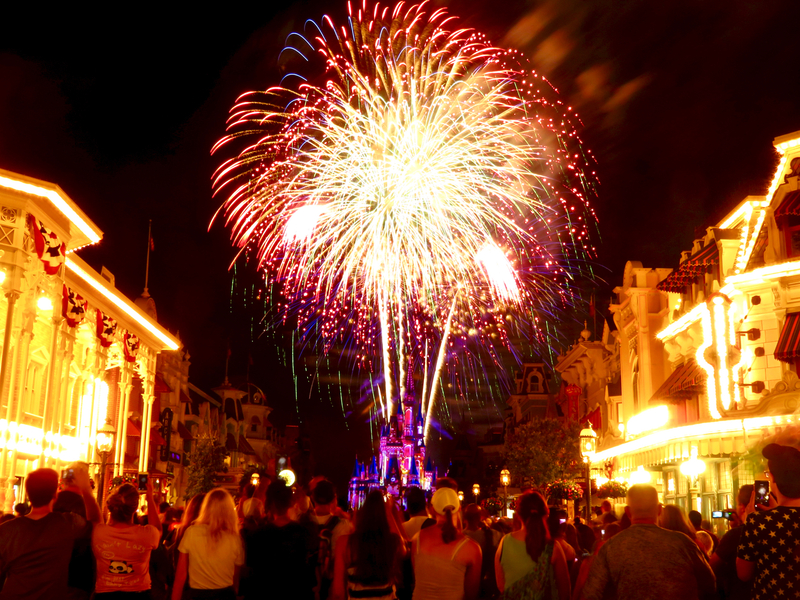 For many day guests in the park, fireworks traditionally mark the end of a park visit (though the Once Upon a Time projection show usually follows the fireworks and, on some nights, Extra Magic hours extend the night, but with much bigger crowds than attend Disney After Hours. Long Exposure Photo by Alan S. Dalinka. A kiss goodnight from #magickingdom at the end of #disneyafterhours (where we were #invitedbydisney). #videobyasd Mini-review by @alandalinka - very fun for someone who wants to get all of the major rides done with little or no wait and have some included popcorn, ice cream, and bottled beverages. A rather high price point for Passholders and day guests with other tickets, especially compared to the Mickey’s Not-so-scary and Very Merry Christmas after-hours party which include lots of additional entertainment and characters (but somewhat bigger crowds than we saw tonight). 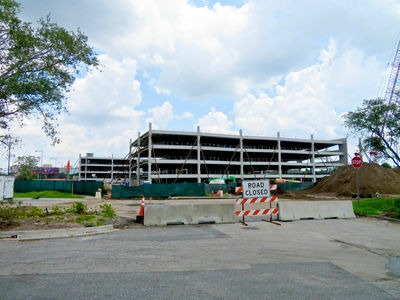 More on Wednesday in the WDW Update on MousePlanet.com. Disney After Hours lanyard-wearing guests head toward the park's exit as the "Kiss Goodnight" plays over the speakers. Video by Alan S. Dalinka. From atop the Main Street Walt Disney World Railroad station at the end of the event, you could see just how sparse the crowd was at the Disney After Hours event on July 14. Photo by Alan S. Dalinka. 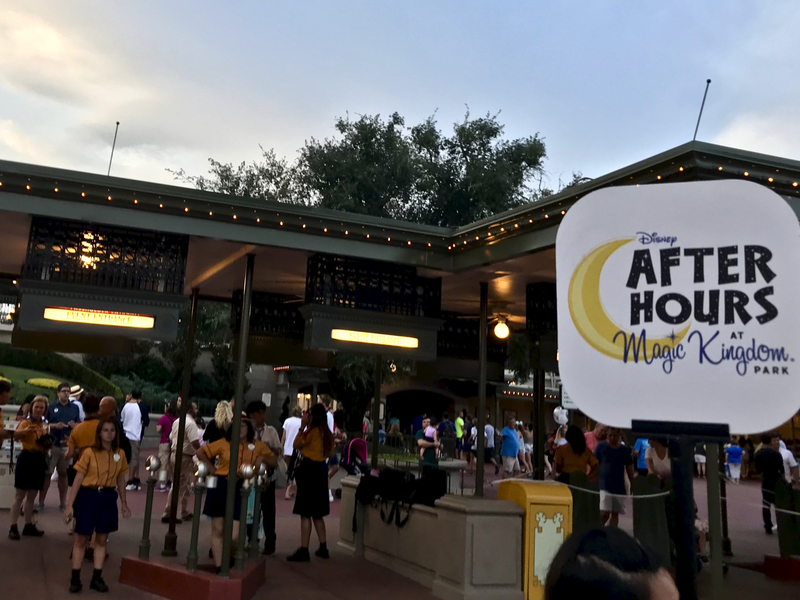 For the remaining Disney After Hours events at Magic Kingdom on July 21 and 28, August 4, 11 and 30, and September 20, the advanced purchase price is $119 plus tax. Disney Vacation Club Members and Annual Passholders may qualify for discounts. If the event is not sold out, the day-of ticket price is $124 plus tax. Visit this page of DisneyWorld.com or call (407)827-7185. As we covered last week, a partial listing of Candlelight Processional narrators is now available. Guests can now book dining packages for both the Eat to the Beat Concerts and Candlelight Processional. Returning celebrity narrators include: Neil Patrick Harris, Whoopi Goldberg, Gary Sinnese, Pat Sajak, and Jodi Benson. For Food & Wine Festival bookings, visit TasteEpcot.com or call (407)939-3378 for reservations and information. Everyone can visit this page of DisneyWorld.com for Candlelight dining package information and reservations. 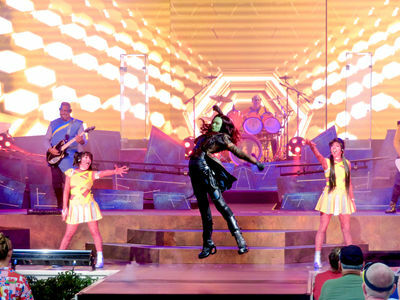 There is just over a month left of Epcot's Incredible Summer performances of the Guardians of the Galaxy-Awesome Mix Live! concert series. 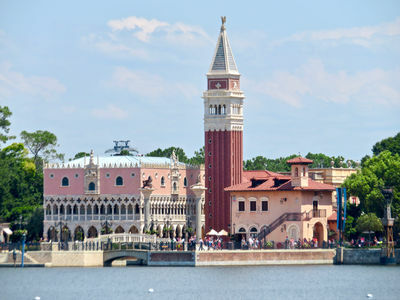 Its published showtimes are 1:30 p.m., 2:30 p.m., 5:30 p.m., 6:45 p.m., and 8 p.m., at the America Gardens Theatre in World Showcase. Passholders can get wristbands for Incredible Summer preferred seating at a podium just inside the entrance to The American Adventure (while supplies last and, as always, be prepared to show your Pass and photo ID). 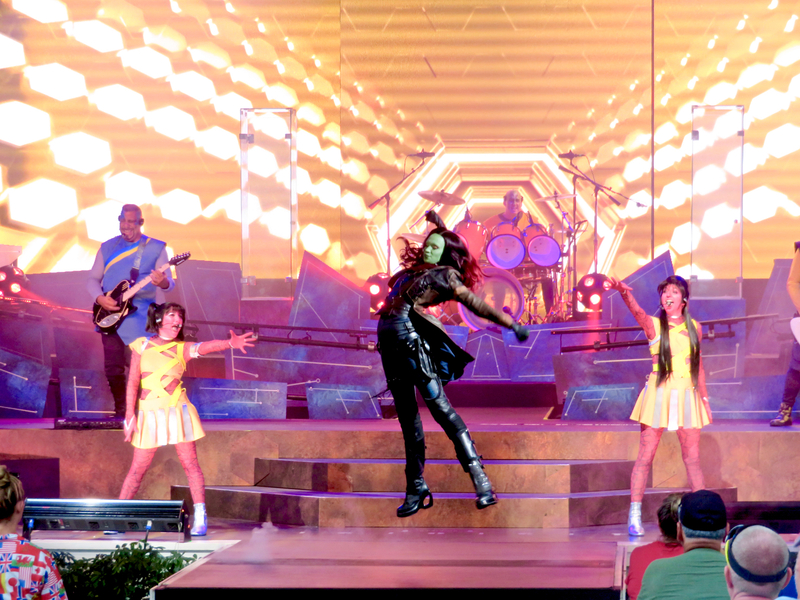 America Gardens Theatre is the Incredible Summer home to the Guardians of the Galaxy-Awesome Mix Live concert series, five times daily through August 19 (only four scheduled performances on July 4). Photo by Alan S. Dalinka. For the convenience of our readers, we list all of the scheduled acts in our Google Calendar of Epcot Events. You can also add it or any events on it to any calendar that supports the iCal format (like iPhone and Mac) by copying this link. 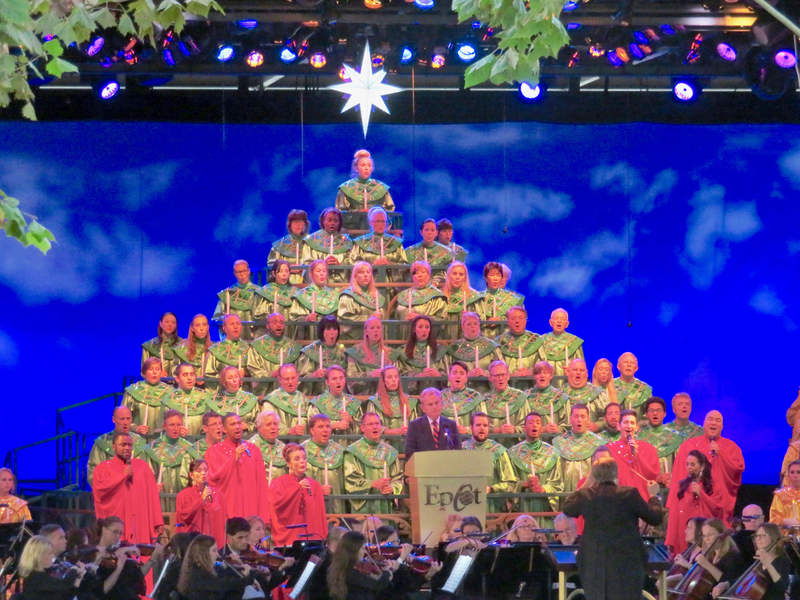 When additional Candlelight Processional celebrity narrators are announced, we will those to our calendar as well. The calendar is provided as a courtesy "as is, where is" without any guarantees. Given the effort it took to create it, we do respectfully request that you do not post our entire calendar on another site without first asking our permission. Walt Disney World Resort does provide schedules in the My Disney Experience app, but does not allow you to add dates to calendars outside the app itself. As always, the captions tell the story and include bits of news along the way. As you may have already noticed, this week, I used a couple of tripods to take long-exposure fireworks photos and you may see more of that as the summer gets warmer and my park visits shift increasingly to evenings when possible. Trader Sam's Tiki Terrace at Disney's Polynesian Village Resort provides a view of Magic Kingdom's Happily Ever After fireworks that includes the musical accompaniment. Long Exposure Photo by Alan S. Dalinka. 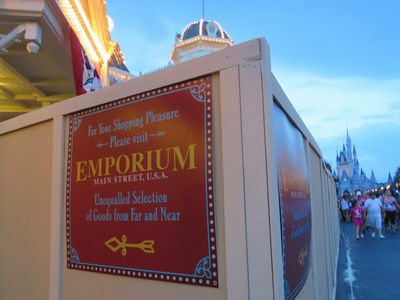 The sidewalk at the newest portion of the Emporium (opposite Center Street) is again surrounded by construction walls. Photo by Alan S. Dalinka. 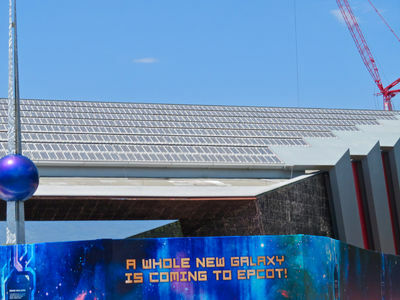 The future Guardians of the Galaxy-themed coaster's building this week appears to have four sides of steel supports in place. Photo by Alan S. Dalinka. 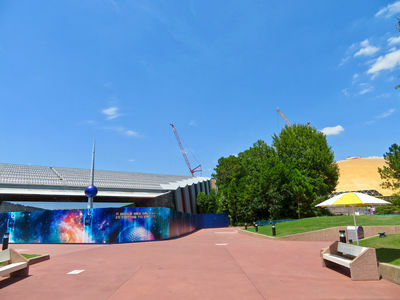 From some angles approaching the Universe of Energy pavilion (which will serve as the entrance to the Guardians-themed attraction), the huge building seemingly disappears behind trees. 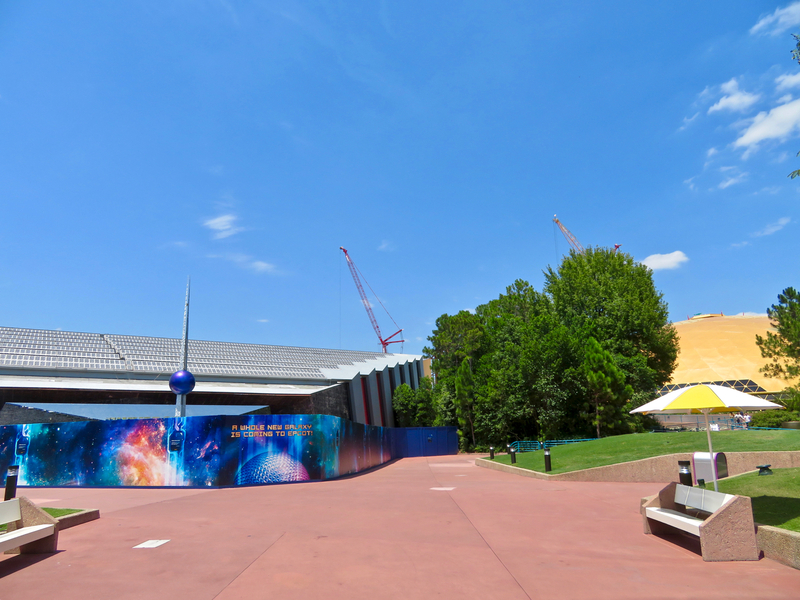 To the right, exterior refurbishment appears complete at the former Wonders of Life pavilion/Festival Center. It was in use at least once last week for a Cast Member function. Photo by Alan S. Dalinka. 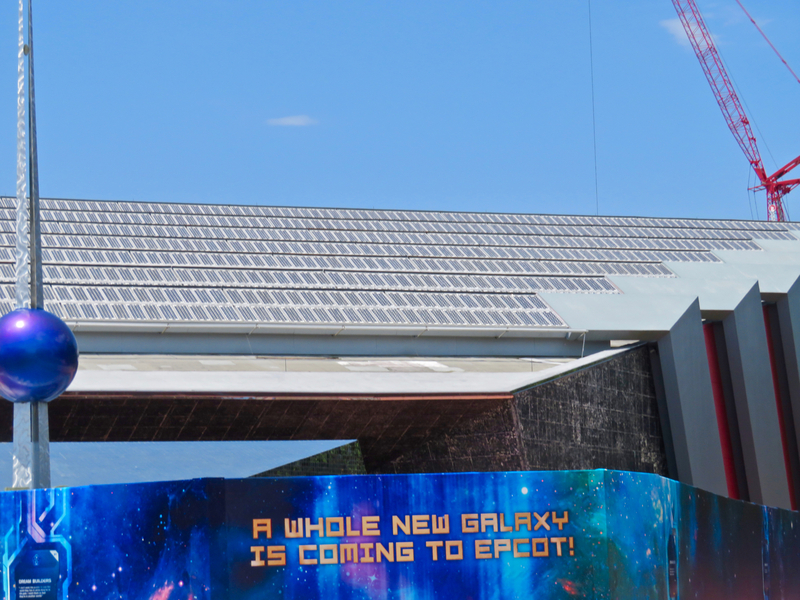 Closer inspection of the face of the Universe of Energy pavilion reveals that the mirrored tiles have been removed. Photo by Alan S. Dalinka. 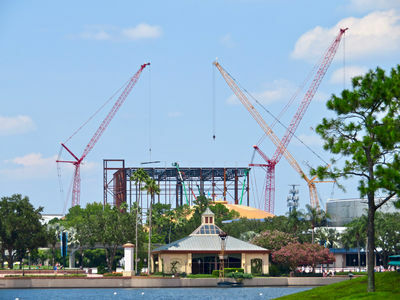 The scope of the building that will enclose the future Guardians-themed coaster is most apparent from the other side of World Showcase Lagoon. Toward the building's left side, a crane lowers a steel beam into place; a worker stands atop an already placed beam near the green crane toward the center of the photo. Photo by Alan S. Dalinka. 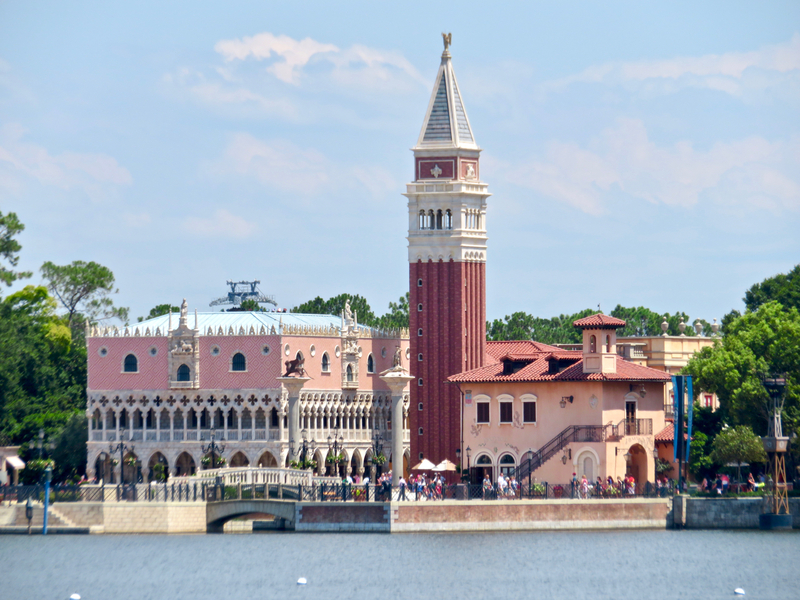 From the Future World side of World Showcase Lagoon, a Disney Skyliner tower can be seen above the Italy pavilion. Photo by Alan S. Dalinka. 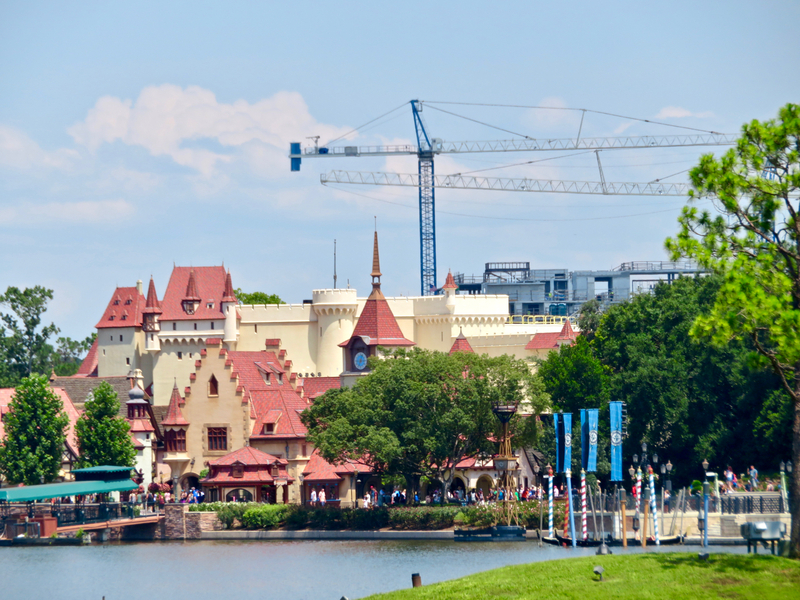 Also from the Future World side of World Showcase Lagoon, the upper levels of the future Disney Vacation Club property, Disney's Riviera Resort rises above the Germany pavilion. Photo by Alan S. Dalinka. 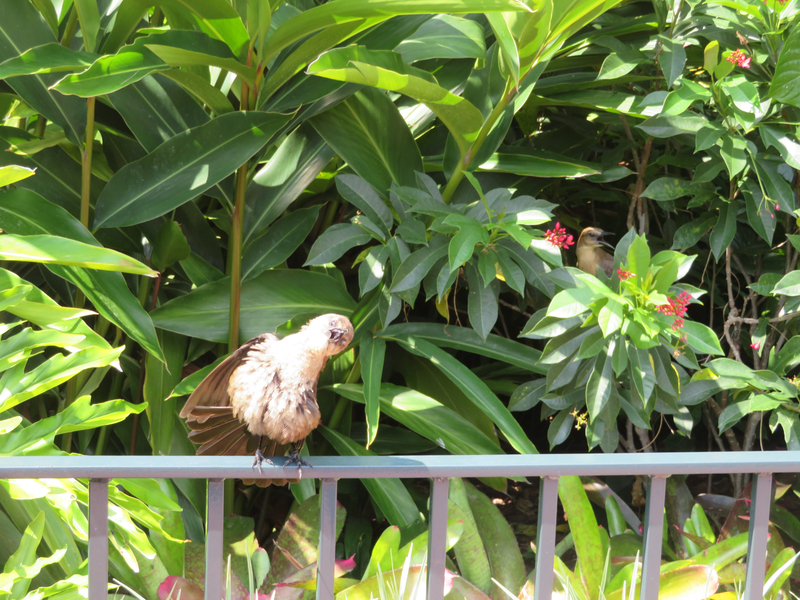 Natural bird behavior may be observed in all seasons at Epcot, not just during the Flower & Garden Festival's focus on the Purple Martin nesting. This pair of birds was just outside the Mexico pavilion along World Showcase Promenade. Photo by Alan S. Dalinka. One Passholder's Tip (bonus edition): since "Frozen Ever After" has now been open for a few years and Toy Story Land and Pandora-The World of Avatar are drawing the interest of lots of guests, FastPass+ reservations for this attraction have become more readily available lately. Video by Alan S. Dalinka. 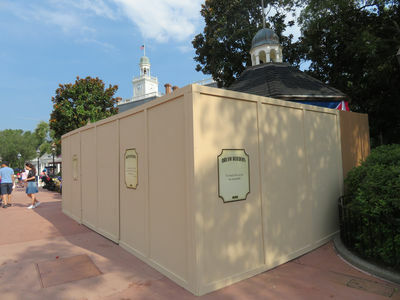 The beverage and pretzel kiosk outside American Adventure is closed for refurbishment. Photo by Alan S. Dalinka. A tripod allows for a long-exposure photo of Illuminations: Reflections of Earth. Long Exposure Photo by Alan S. Dalinka. The male lion was surprisingly active and vocal during a late afternoon Kilimanjaro Safari last week. 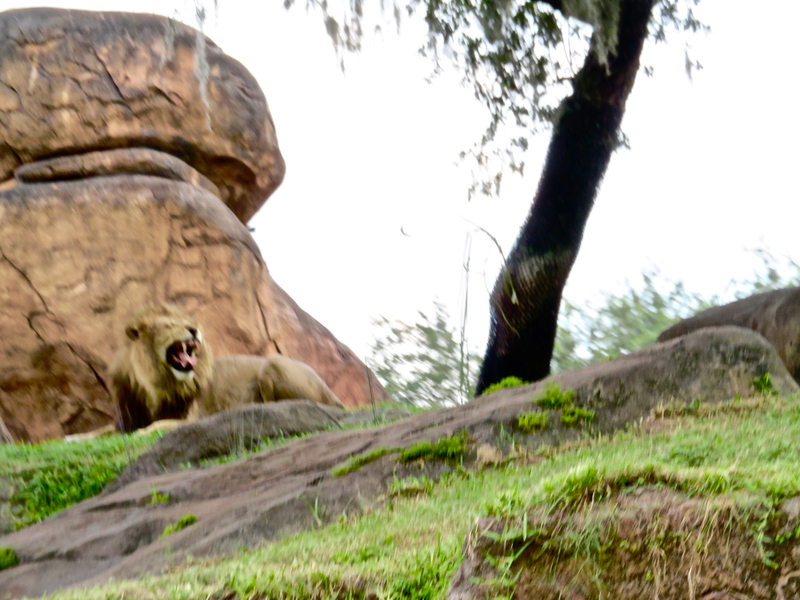 As the Cast Members say, lions tend to sleep up to 20 hours a day and are most active at night. Photo by Alan S. Dalinka. 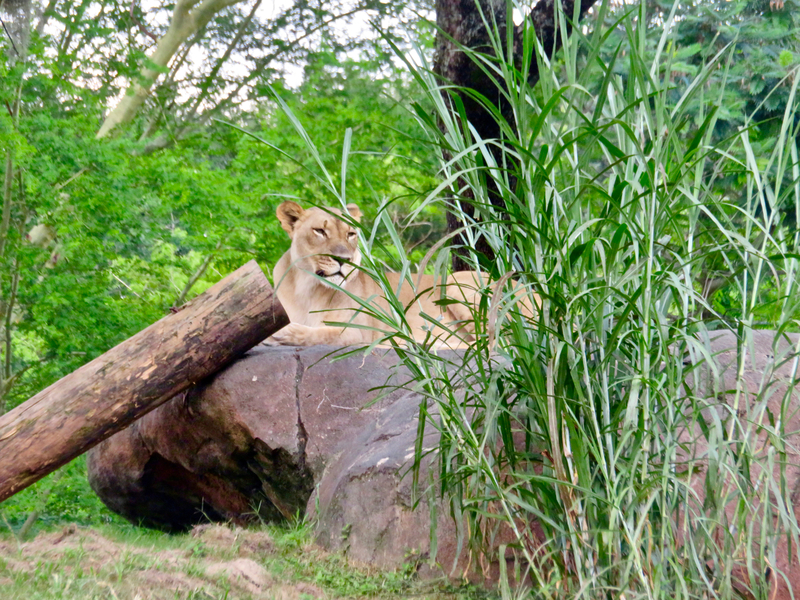 The lionesses were also at attention. Photo by Alan S. Dalinka. 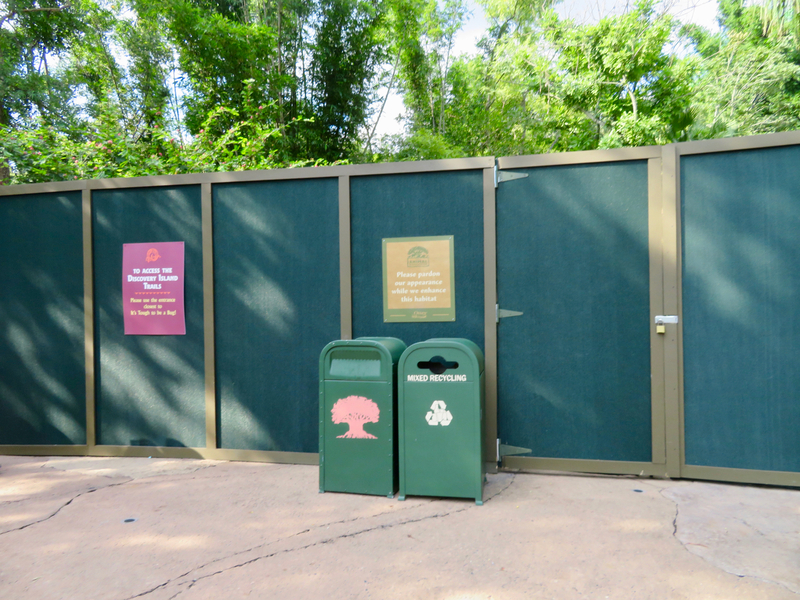 Some of the trails on Discovery Island around the Tree of Life are walled off for refurbishment. These are near Pizzafari on the Tree of Life side of the walkway. Photo by Alan S. Dalinka. Construction of the new parking garage across Buena Vista Drive from Disney Springs has reached a stage where the usual exit from the Speedway Gas station is now closed. Entering the station from Buena Vista remains open, but cars exiting are routed behind of the the Disney Springs support buildings to the road past the Team Disney Building to the traffic light opposite the western-most entrance to the Disney Springs parking lot. Photo by Alan S. Dalinka. …Passholders that were still hoping to get the Donald Duck summer magnet but missed that June 29 deadline, there is some good news. Disney announced that they are still available (while supplies last) for pick-up at Mouse Gear at Epcot now through July 31. Be sure to have your valid pass and photo ID on hand to get it. 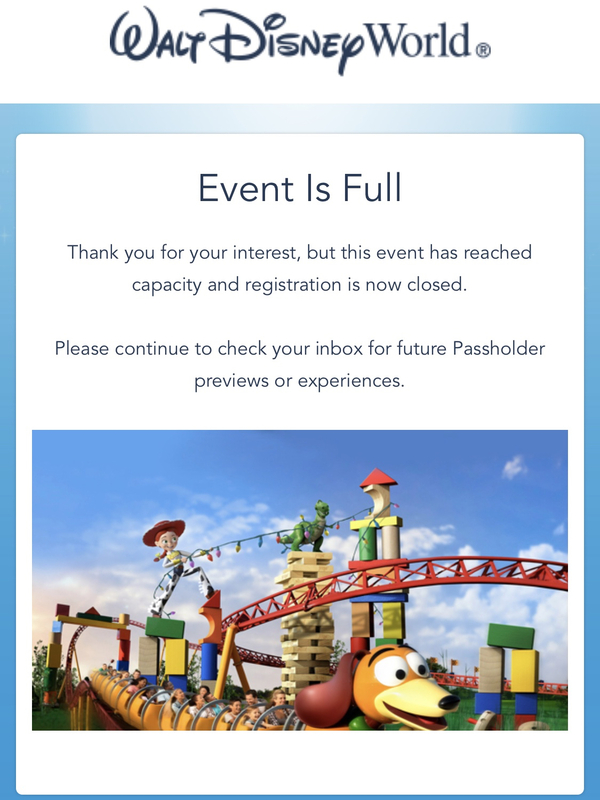 However, Gold Level and above Passholders that did not register early in the day for the Passholder-exclusive Toy Story Land access in September will discover that all slots are now full. By the evening of July 11, the Passholder-exclusive access to Toy Story Land registration had reached capacity. Screenshot by Alan S. Dalinka (underlying content by Disney). …runDisney's 2019 Walt Disney World Resort Marathon Weekend registration opens to the public tomorrow, July 19. Disneyland and Walt Disney World Passholders, Disney Vacation Club Members, and Golden Oak residents may have access to early registration now. Visit runDisney.com for more information. (Disclosure: at the conclusion of the Walt Disney World Sports media event for ESPN Wide World of Sports, I was invited to participate in the 2019 Walt Disney World Marathon Weekend, and, since I have been walking 5-10 miles nearly every day for over two years now, I may accept that invitation to try my first ever 5K race even though I am not a runner and I am not particularly fond of what Adrienne Vincent-Phoenix calls "Disney Dark 30," the 5:30 a.m. race start time with required earlier reporting time). Pixar Party: A New Year’s Eve Celebration (8 p.m.-12:15 a.m.)—the family-friendly party has Sarge welcome guests arriving on the second floor of the resort who will then find the party spaces decorated to represent Disney-Pixar films including Inside Out, The Incredibles, Finding Nemo, and Up, along with favorite characters. Sarge also leads kids' Boot Camp, and the evening includes Pixar Face Painting, a balloon artist creating Pixar characters, a DJ playing Radio Disney tunes from a Cars-inspired set-up that looks like it came from Radiator Springs. 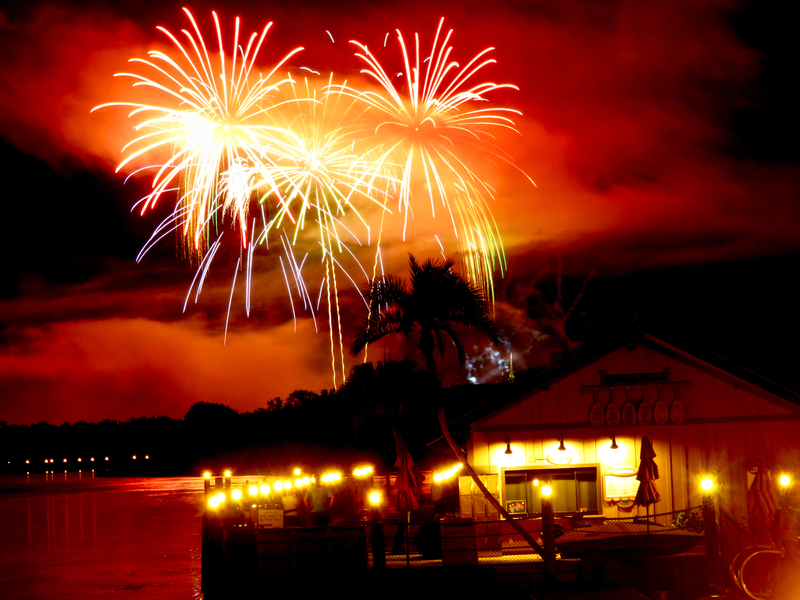 Also included is a themed buffet dinner and an opportunity to view Magic Kingdom's New Year's Eve fireworks. Tickets are $190/person (including tax and gratuity). Disney Countdown to Midnight (8 p.m.-12:15 a.m.)—the more adult-oriented party includes dining and dancing in the Fantasia Ballroom in the Convention Center. Of course, it is still a Disney event, so the evening will include such touches as a Mickey Mouse mirror ball and character topiaries, and Mickey and Minnie will make a special appearance. A "high-energy" New Year's Bash band and a live DJ provide music all night and a "cheftainment" station will feature a "seasonal menu inspired by some Disney Signature Dining restaurants." The evening is capped with a Champagne flute on the porte cochére with a view of the Magic Kingdom's New Year's Eve fireworks. Tickets are $275/person (including tax and gratuity). And, if that is not enough celebration, an enhanced VIP ticket is also available, that additionally includes the "Ink and Paint Club Experience" adjacent to the Fantasia Ballroom in a "vintage Disney Animation-inspired room" available all night, starting with a reception from 7-8 p.m. that includes photo opportunities with Mickey & Minnie with a unique Disney Animation backdrop, a live pianist, chef stations featuring king crab, tuna tartare, sheep’s milk ricotta gnocchi, cocktails, Champagne, cordials and more. The enhanced VIP ticket is $450/person, is only available when purchased simultaneously with the Disney Countdown to Midnight ticket (not as an add-on at a later date), and includes reserved seating in the Countdown to Midnight Party when it opens at 8 p.m.
…Disney Parks Blog announced that Disney's Animal Kingdom will finally join the other Walt Disney World theme parks in offering a nighttime dessert party. Starting on Monday, August 6, on select nights (currently scheduled on Monday, Thursday and Saturday through November 3), you check in at the Rivers of Light Asia Viewing Area Terrace across from Expedition Everest an hour before the "main" show (for example, at 8:15 p.m. for a 9:15 p.m. show), have desserts, snacks, and specialty drinks (including alcohol for those 21 and over), and then head down to the VIP reserved seats for the Rivers of Light show. Reservations are now open at this page of DisneyWorld.com or by calling (407)WDW-DINE. The party is $79/adult; $47/child (including tax), paid in advance, and can be booked up to 180 days in advance (but, as noted above, the party is currently scheduled only through November 3), with cancellation allowed up to 120 hours of the show (that's five days). Discounts are available (like DVC) which will be reflected at online checkout based on your My Disney Experience account; dining plan credits, however, are not accepted. …Back to the Orlando City Soccer Club, whose players Jonathan Spector and Jo Bendik helped out with the Opening Ceremony for Disney Cup at ESPN Wide World of Sports, Disney Parks Blog showed them along with fellow players Uri Rosell and Sacha Kljestan joining in on the whole Toy Story Land "play big" theme with some drills with the Green Army Men and a giant inflatable Pixar Ball. Orlando City Soccer Club joined in on the Toy Story Land hoopla this week. Video © Disney. …Master Sommelier George Miliotes hosts a blind tasting of six wines at his Wine Bar George at Disney Springs this Friday, July 20, from 2:30 to 4 p.m. Tickets are $50 plus EventBrite fees (adults 21+ only) and can be reserved here. …Do you know all about the latest styles and fashions? Can you easily distinguish rose gold from millennial pink, yet can't help but to buy Disney merchandise in those colors (or, at least, crave what you can't yet afford)? Well, get ready because the next "in-demand" colors are making their way to Walt Disney World Resort merchandise locations: iridescent. Read more about the merchandise now available at Disney Springs on Disney Parks Blog. Is stylish food more your thing (or your thing too); Disney has you covered there too, and, in fact, lots of other new foods for broader palates as well. In fact, if you often visit Walt Disney World, know a lot about Disney fashions, lifestyle, and/or food, and are a good writer, let me know by email , there are some folks at MousePlanet that would love to meet you too! …And, finally, also in Central Florida (but a bit of a drive over to the East Coast from Walt Disney World Resort), the 11th annual Tour de Turtles will be held at Disney's Vero Beach Resort on Saturday, July 28. This dawn event combines the Disney Animals, Science & Environment Team with the Sea Turtle Conservancy, in the release of loggerhead turtles that are be tracked by satellite during their journey from their nesting grounds on the beach to where they forage. This year, Disney Parks Blog is sponsoring the event, so it will be providing live coverage of the release (exact details have not yet been announced), and is encouraging readers to vote on Toy Story-inspired names for the turtles to be released. Last year, we were there when Sally and Cruise were released (inspired by Cars 3) and followed along their journeys of hundreds of miles each on the TourDeTurtles.org website. We are not yet sure whether this event will include invited media but, as a Disney Vacation Club Member, I will be there as a resort guest. Every Thursday and Saturday, now through August 11; 8–11 p.m.
July 21, 28, August 4 & 11; 10 p.m. – 1 a.m.
2019 Walt Disney World Marathon Weekend – January 9–13, 2019. Liberty Square Riverboat – closed for refurbishment (cast say reopening possibly late July). Stitch's Great Escape – My Disney Experience lists as "available seasonally throughout the year." Kringla Bakeri Og Kafe at Norway pavilion – closed for refurbishment through summer 2018. 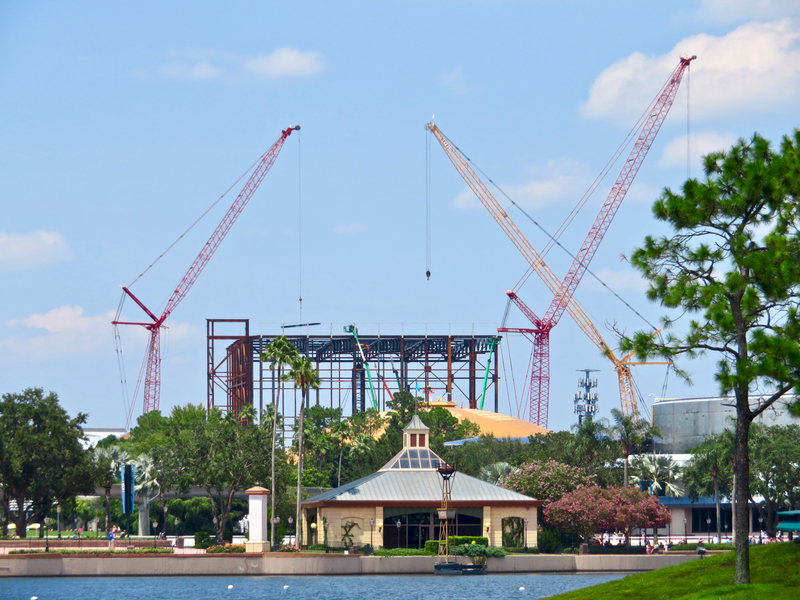 Caribbean Beach – Centertown, the resort's marketplace, will be expanded with new waterfront dining and retail shopping areas. The first phase of the project is expected to be completed in Summer 2018, with the overall project completed 2019–20. Coronado Springs – A new 15-story tower overlooking Lago Dorado, the resort's central lake, will add 500 rooms featuring suites and concierge level services, and a rooftop dining facility that will include panoramic views of nighttime fireworks shows at the Theme Parks. 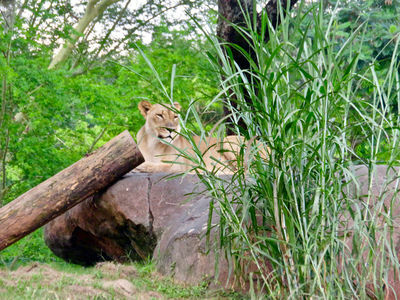 The resort also plans to refurbish current resort rooms and transform some of its landscape. 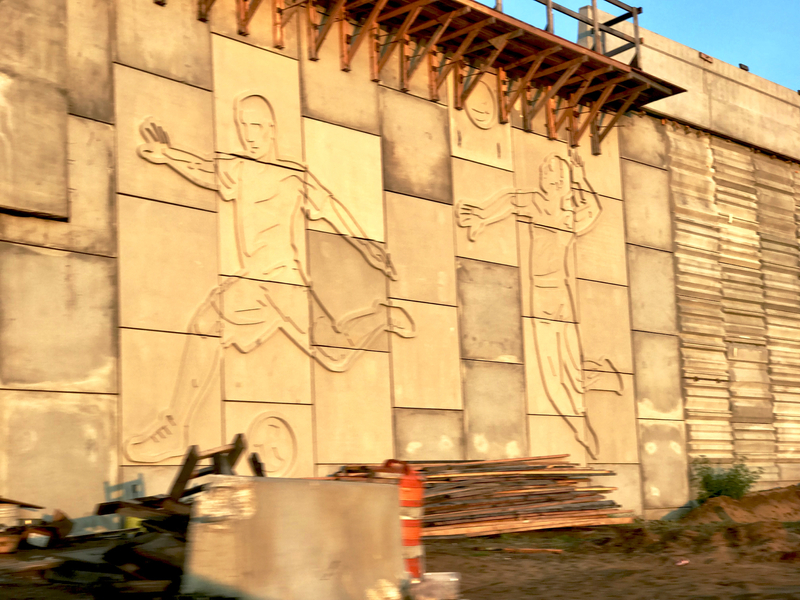 The project is expected to be completed 2019-20. Disney Parks Blog announced details of a limited time deal for guests planning to visit during the week of Labor Day, September 3, and departing on September 8. The package includes a five-night stay at a select Disney Resort, four-day Magic Your Way tickets, plus a special "welcome dinner party inspired by" the Epcot International Food & Wine Festival, a nighttime Kilimanjaro Safaris Adventure, exclusive Rivers of Light viewing, two hours of exclusive evening access at Toy Story Land, and Mickey's Not So Scary Halloween Party at Magic Kingdom. The deal must be booked by August 19. The full details are on this page of DisneyWorld.com or you can call (407)939-5268 and ask about the "Ultimate Disney Fall Into Magic Package." You must show your passholder (gold) card and photo ID to receive a discount and other benefits. Gold, Platinum, Platinum Plus, and Premier Passholders should have been "on the lookout for an event invitation with registration details in email" for "exclusive" access to Toy Story Land at specific times on select dates in September. 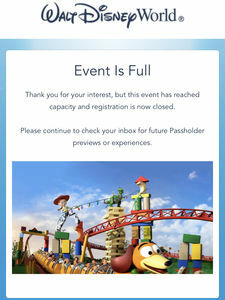 Eligible passholders that wanted to attend needed to have followed the email instructions to register for an event date and time in advance and, if they would like to register a guest, that guest also must have a Gold, Platinum, Platinum Plus, or Premier annual pass and be listed on the Friends & Family list sharing "All My Plans" in My Disney Experience. Attending the event will require the valid pass and a matching photo ID, but there will be no additional charge. The email was sent on July 11, and, by that evening, registration had filled to capacity. Disney Visa cardholders receive 10 percent off the check when you pay with a Disney's Visa Card and/or Disney Rewards Redemption Card (be sure to request the discount). Offer excludes alcoholic beverages, merchandise, tobacco, room service, holiday buffets, tax and gratuity. Discount does not apply to the following dates: 12/31/17, 1/1/18, 2/14/18, 4/1/18, 5/13/18 and 7/4/18, and may not be available at all meal times. Visit this page of disneyrewards.com for the latest list of restaurants and restrictions. While the Discover Disney ticket offer ended on June 24, still available at a higher price (but including flexibility), Florida residents can still save quite a bit with the 4-Day Disney Select Ticket (compared to the price of a 4-Day Magic Your Way ticket). There is a smaller discount available for a 3-Day Select Ticket, and there is also a discount for 1–Day Tickets with the Park Hopper Option only. For more information visit this page of DisneyWorld.com. Florida Select tickets expire 180 days after first use. First use must be on or before December 31, 2019. Florida Select tickets do not need to be used on consecutive days. Prior to first use, all adults using Florida resident tickets must show an acceptable form of proof of Florida residency at a theme park ticket window, or at any Guest Relations location. Pass certificates can be exchanged for valid passes at the same locations. All adults using Canadian resident tickets or passes must present valid proof of Canadian residency that includes government-issued photo ID to exchange the certificate for a valid ticket at the theme park ticket window or Guest Relations prior to first use. Tickets and options are nontransferable, nonrefundable and exclude events/activities separately priced. Admission is subject to capacity closures and to other restrictions. You can see the latest offers for U.K. residents on Disney World's U.K. packages website. It currently includes an offer for UK and Ireland guests: 2018 Disney's 14-Day Ultimate Ticket for the price of a 7-day ticket when purchased pre-departure by July 31, 2018, for arrivals up until December 31, 2018. Memory Maker is included with every 2018 Adult Ultimate Ticket purchased. I didn't know what to do during lunch yesterday. I even took it a little later hoping the Update would be available. I was lost. But know I am back up to speed and I am pretty sure that we don't need a Wide World of Sports update for another 10 years? Not that I don't like sports, just not really what I go to WDW for. The big take away for me was your excellent break down of the after hours party scheme. Thank you for explaining that to us. I really like to see all that bare pavement at the Magic Kingdom but $120 is real money to us. Maybe I will get lucky with the lottery? Thanks for the comments, Chuck. Sorry to confuse your Tuesday - I did make sure we put out word on Social Media of the schedule change this week when it was clear we would rearrange the publication schedule. Follow @MousePlanet on Twitter for the latest (also Facebook and Instagram). Thanks for the comments. And, while McCormick Place may be larger, it is losing convention business to Orlando, Las Vegas and other cities because of the cost of doing business there (and, of course, the weather doesn't help). As a relocated Chicagoan myself, I always enjoy seeing all the Illinois license plates and have noticed an increase in the number of frames from Chicago-area car dealers with a Florida plate within.